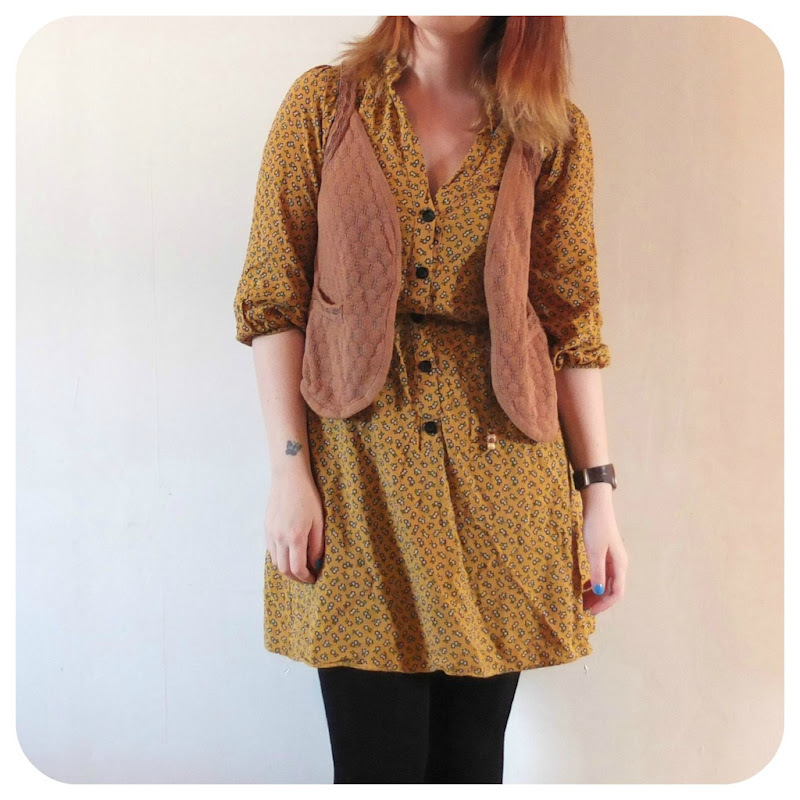 I bought this mustard dress from Matalan about year ago I think. I remember falling immediately in love with it, and especially because it was such a cheap price. I’m sure I only paid £14. It’s really comfy to wear and on days where it’s on a hanger in the wardrobe, it doesn’t crease as easily as these images would lead you to believe. The little knitted waistcoat thing was from Primark and I don’t think I’ve ever actually worn it! It was one of those spontaneous ‘only cost a quid’ buys. 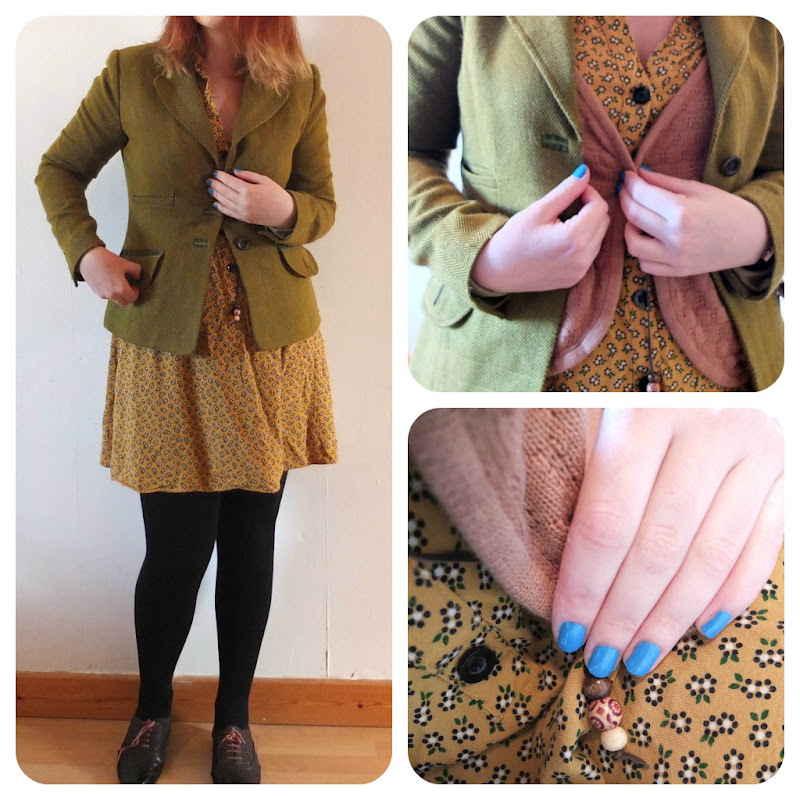 The tweed blazer I have had for years, I bought it off ebay for about £5 and it’s a proper horse riding one. I have a long term love affair with all things tweed so I’m pretty psyched this whole ‘heritage’ trend is back in fashion! I’m also rocking a slightly unusual nail colour for me, in the form of Accessorize ‘Dance’. I usually dislike most things blue but I really like this. It’s a really feel good colour. My shoes are another recycled classic and are purple brogues that I bought many years ago from a *proper shoes shop* in Manchester. They were on sale but were still pricey! They have nails in the sole! Sometimes investing that little bit more really does prove to be worthwhile. Have you rediscovered anything in your wardrobe lately? I’m happy that I have and it turns out they’re kind of ‘in’ right now too!